Abstract: The Guide to the Code of Ethics for Nurses with Interpretive Statements: Development, Interpretation, and Application, 2nd Edition is an essential resource for nursing classrooms, in-service training, workshops and conferences, self-study, and wherever nursing professionals use ANA's "Code of Ethics for Nurses with Interpretive Statements" in their daily practice. Each chapter of this comprehensively revised text is devoted to a single Code provision. 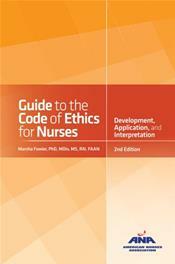 ... For convenience of reference, the text of ANA's "Code of Ethics for Nurses with Interpretive Statements" is included as an appendix. This book will challenge each nurse to achieve deeper professional and personal understanding, and will provide a foundation for professional pride. 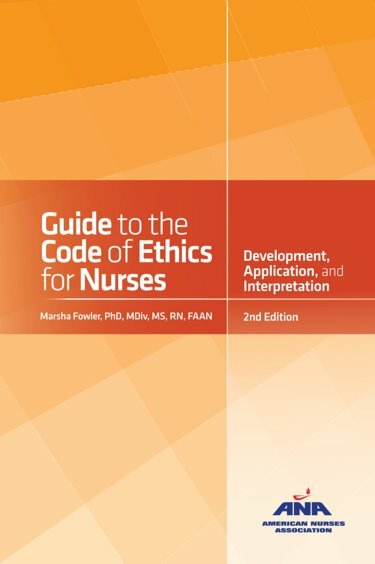 From the classroom to professional practice, nurses in all roles or settings will find "Guide to the Code of Ethics for Nurses" to be a powerful tool for learning how to examine and apply the values, duties, ideals and commitments of their living ethical tradition to their practice.